Samsung unveiled its take on the collaborative digital whiteboard at CES today, launching its Flip display. Digital whiteboards are getting a lot of attention from a number of large vendors, including Google, Microsoft and Cisco. All aim to replace traditional flip charts and whiteboards with touchscreen-enabled hardware designed to ease collaboration during meetings and brainstorming sessions. Up to four different participants can interact with a Flip whiteboard at the same time, using either their fingers or a stylus to create or annotate content. Designed for use in meeting rooms, the 55-in. 4K display can switch from portrait to landscape orientation depending on company needs. It includes USB ports to enable connection to PCs and mobile devices, as well as wireless connectivity. An integrated screen-sharing capability allows Flip content to be viewed directly from PCs and mobile devices, which would be useful for remote workers, in particular. Flip runs the Tizen operating system used in a variety of Samsung products, including its smart TVs, and contains 8GB of internal storage. Samsung set the retail price for the Flip at $2,699; rival digital whiteboards are more expensive. Google's Jamboard for G Suite, released last year, retailed for $4,999 at launch, while Microsoft’s SurfaceHub costs $8,999 for the 55-in. version. However, those devices offer integration with each company’s respective business software suite, providing them with an advantage over Samsung’s Flip. 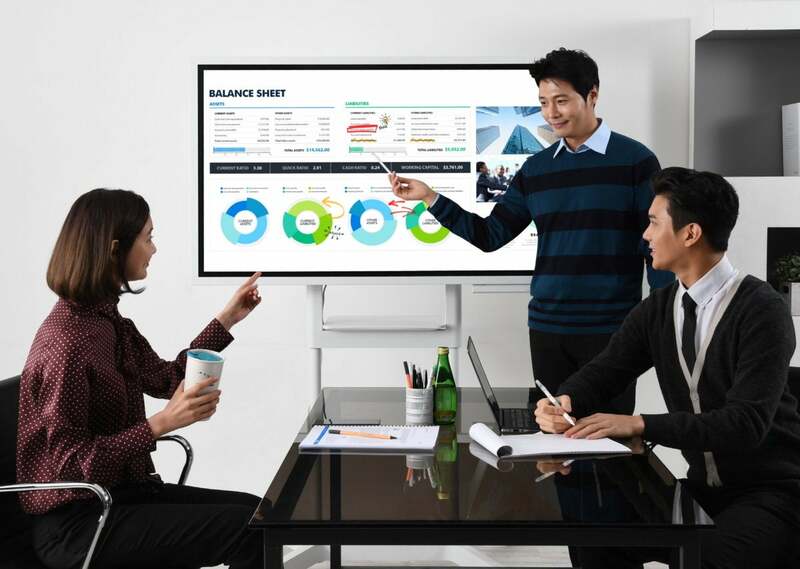 Meanwhile, Cisco’s Spark Board integrates with its Spark collaboration software and supports video conferencing. He noted that Google and Microsoft are strong contenders as software providers while Samsung is already present in meeting spaces, thanks to its PBX phone systems and smartphones. Competing with other feature-rich products is just one hurdle for those offering digital whiteboards, said Larry Cannell, research director at Gartner. Digital whiteboards have been around in some form for years and vendors have yet to convince substantial numbers of users to swap tried-and-trusted tools for digital alternatives. “The challenge with these products isn’t necessarily integration with back-end software,” said Cannell. “Rather, they are still competing with in-room physical whiteboards and large sticky flipcharts. “From my experience, most digital whiteboards have ended up being most used as fancy digital projectors,” he said. Despite the launch of new hardware by some major vendors in the past year, customer demand is “still building momentum,” Castañon-Martinez said. That is likely to change over the next year or two as hardware becomes increasingly integrated with collaboration and productivity software. “Digital whiteboards are at the intersection of productivity and collaboration, unified communications and telephony, and audio and video conferencing,” he said. “All of these are in transition with new technologies emerging.